A katava ia takeke holi! I do like geraniums. The problem is I don’t like the word “geranium” in English (sounds ugly to me). I actually don’t much care for the word in Kamakawi, either. Huh. Really, though, the flowers aren’t all that bad. I mean, they’re all right. They’re flowery; have a pleasant smell. I’d like to have geraniums, I think. I just wouldn’t refer to them by name. I’d call them “those flowers out front”, or something similar. Notes: Got a couple of stray thoughts that I want to tack down here before I forget them. First, this iku is built off mo, which is one of my favorites. Today my wife told me that a day or two ago she informed me that Portlandia is streaming on Netflix. I’d been wanting to watch it, since I’d heard good things, and was quite pleased with the first two episodes (we’ll have to wait to see the rest). Today’s iku reminded me of the “Put a Bird On It” sketch. Anyway, then thinking about this post, I thought about how this iku is a part of the mo series. What this means is that it’s one of the iku that’s built off of mo. That’s really how I think of Kamakawi iku (or at least those that are built off other iku), but I have no way of searching them (e.g. if I think of an iku, and know it’s basic shape, I can’t go to my computer and type in, “Search for the one that kind of looks like novu, but upside-down”). That’s when a thought occurred to me. Once I finish putting up all the foma and retire this blog, I can go back through all the entries and just add tags. I’ll probably want to come up with a native Kamakawi word for “series”, but then I can tag, for example, every foma that’s built off of mo, and, since every iku will be here on the blog, I can search them! Hooray! This is also what’s stood in the way of encoding Kamakawi’s script in the Conlang Unicode Registry. I’d reserved a block, but then I had to come up with official names for each glyph and decide where it would be assigned. It was only afterwards I realized what a monumental task that would be, given the size of the Kamakawi orthography, and the design. But! Maybe if I actually get everything up here and get it all tagged, it’ll be easier to do. Notes: Well, not quite, but holly is a type of ilex, and it does seem to be the season… So here’s a picture! I have a very particular vine in mind, though. It suits the climate, I think. Also, in case you haven’t heard it elsewhere, the 2011 Smiley Award went to Matt Pearson’s Okuna! It’s a great language, and if you have some time, I recommend you give it a look. Not bad! 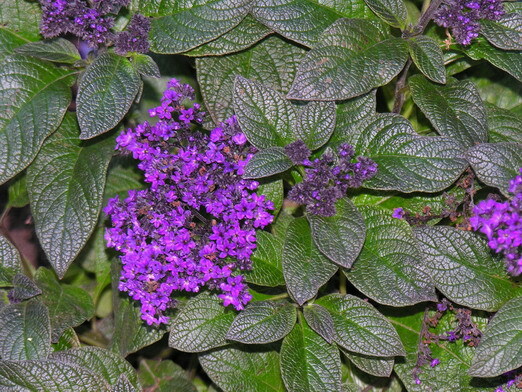 The iku for “heliotrope” is supposed to look like heliotrope. It might be a bit much, but, honestly, have you seen Egyptian hieroglyphic?! Take a look at how crazy some of these glyphs are (Unicode chart go)! Kamakawi’s iku are tame by comparison. Notes: Okay, I know there must be some reason this word exists. I remember I really liked the idea for the iku, but it couldn’t have just been that. I must’ve come across it in a dictionary somewhere… Either that or I was reading up on petrified trees—something. I know I wouldn’t have made a basic term for “petrified tree”—and an ikuiku to boot—without some very clear, very real excuse. That’s my excuse. For the time being.